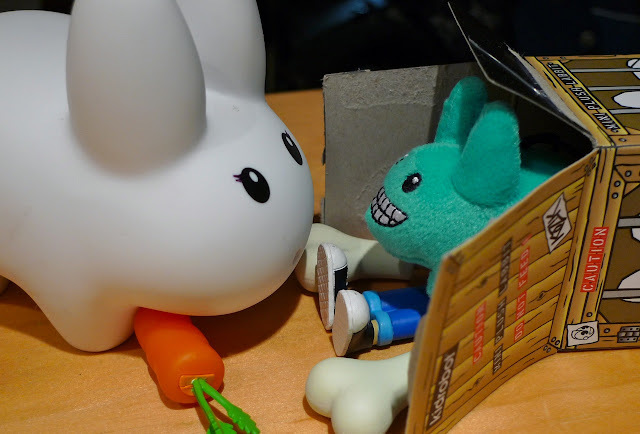 Year of the Labbit: Mystery Guest! Late this evening Clover heard a knock at the door. When she opened the door she only found this crate. It had some ominous warnings. 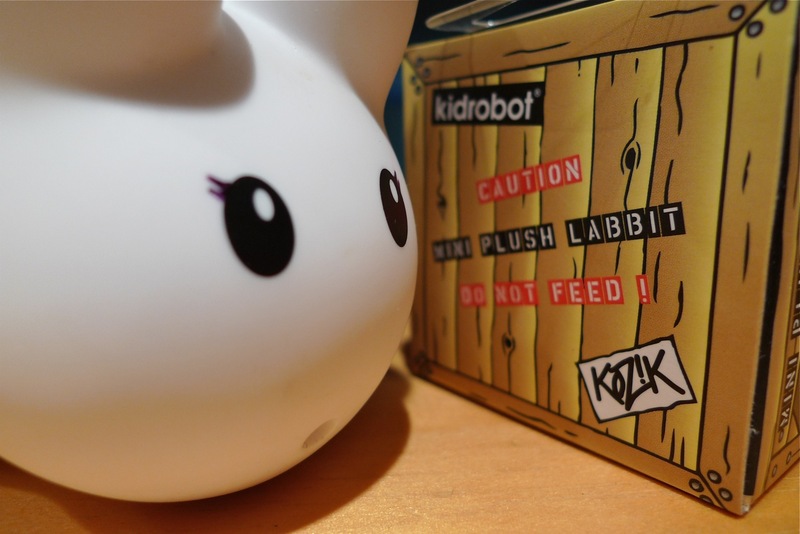 She couldn't understand why there'd be a warning to not feed the labbit. After all, what harm would come from feeding a sweet, innocent labbit? 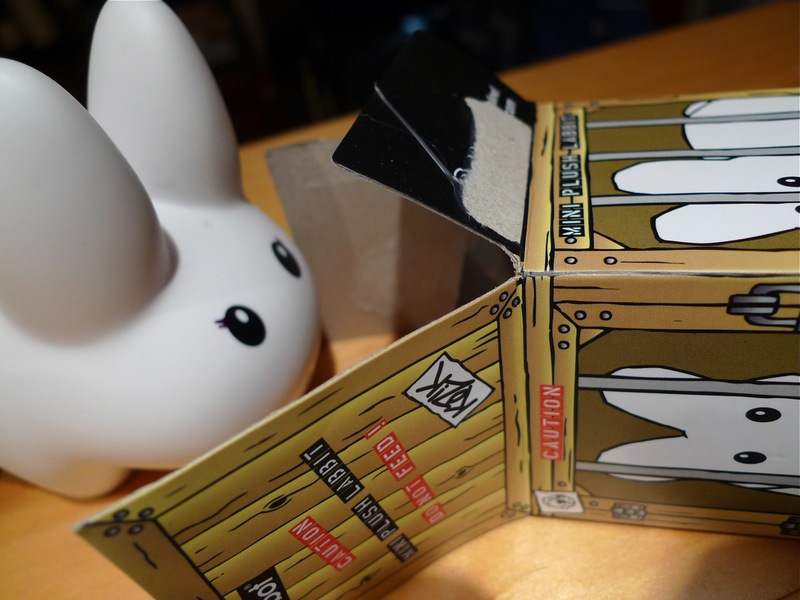 How could a little white labbit survive barred up in a crate without any food? She quickly opened the box and heard shuffling in the darkest corners of the crate. "Little labbit," she asked. "Won't you come out?" ...a pile of bones and sneakered feet came tumbling out of the crate. And climbing over them came this furry green labbit! 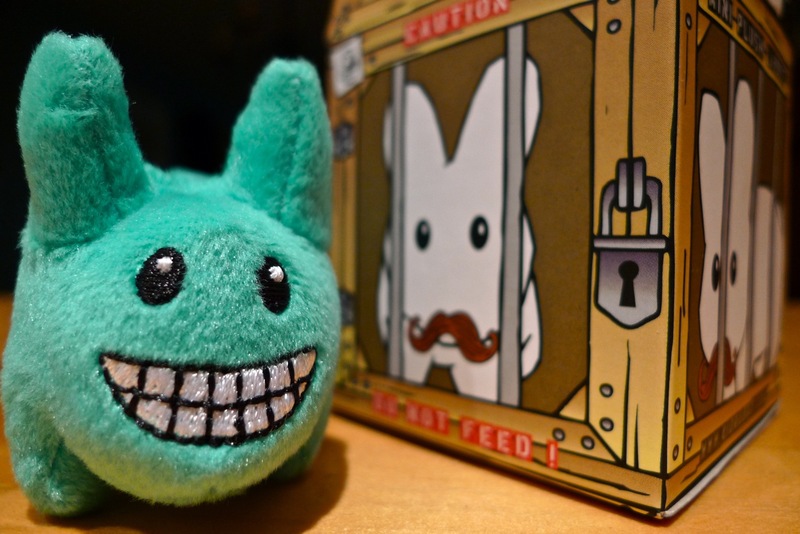 Apparently feeding him turns him from a cute, fluffy white labbit into this green, mischievous grinning labbit. He even seems to have lost his charming moustache with his diet. Other than his hue, he looked to be in good health (fat and bunchy, as a bunny should be) and he did seem rather happy to be free from his crate. In any case, Clover told the little green labbit that the color of his fur didn't matter to her or their warren, so she invited him to stay, and he said yes! The labbits, of course, are eager to feed this little guy, but he better get rid of all those bones. Labbits are vegetarian! They are so cute. I would kill for them. Maybe he's just seasick from the voyage? 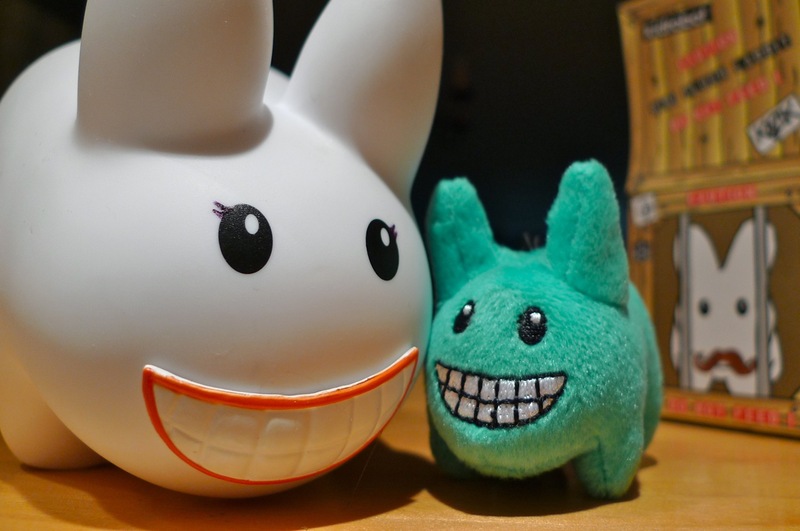 I think Mystery Labbit has a crush on Clover. Lily and Tigger the Stuffed and Striped Labbit. She is quite the cutie, who wouldn't have a crush on her? Labbits can't help it! They are (mostly) all born with a serious wanderlust. Pipkin and Domo are headed out on the road on Monday...finally, more adventures! I bet they'll have fun! In fact, the labbits and I are traveling up north to DC. They can't wait!